form meets function in the tiny kitchen nook. Making the most of the space you have holds true for every room of a home, especially the kitchen. When every square inch counts, it’s important to maximize the area with both form and function. Enter 41 smart and stylish solutions for decorating the little nook in your kitchen! Packing in style into one little nook clearly has its benefits. 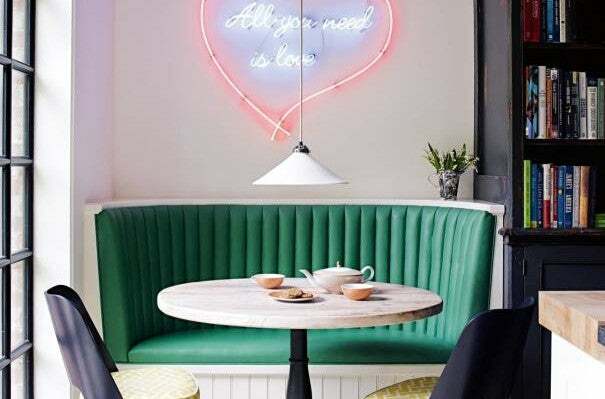 The eclectic yet utterly captivating pairing of the green booth and pink neon sign is pure perfection. This clever piece combines the kitchen table and seats all into one very style-savvy nook. Outfit the little rustic kitchen cove with a lengthy dining table and a handful of patterned pillows for a colorful pop. When your kitchen nook also doubles as the most stylish part of your home, there’s no room for being modest with the design. Take some style risks and go big! Elevate the typical bay window setup by decking the area with patterned pillows and a compact kitchen table. Pair the space with an intricate wallpaper pattern in a vibrant color scheme to really help the nook stand out! A kitchen nook that comes with a fireplace is about as picture-perfect as it gets. Furnish the area with a slew of cozy textures and rustic accents in an earthy color scheme. Install a set of a floating shelves within the empty space between two cabinets. Bonus points for a backdrop as vibrant as this! A monochrome setup is instantly elevated by a pair of matte black chairs, which provide an industrialized accent to the neutral design scheme. This spacious nook comes with cabinets, ample storage space, and a lengthy seat for the family-sized kitchen table. Pair a cushioned bench by the window with a side table for a cozy reading spot. Deck the kitchen nook with a boho chic vibe by opting for an assortment of textured pieces in varying color ways. Paint the tiny kitchen nook with a two-toned palette in a soothing shade. For a Scandinavian chic vibe that’s all about minimalism, opt for a select few muted pastel furnishings to give the nook a more varied feel. Utilize an empty nook for storing clunky kitchen cookware. A narrow wall space is transformed into a statement seat extending high along the kitchen wall. Install a single floating shelf going along the walls of the kitchen (windows included!) to really make use of all of the available space. This mod-meets-rustic kitchen nook makes clever use of the built-in, two-toned shelves by furnishing them with decorative accents that add depth to the area. Lucky enough to have floor-to-ceiling windows in your kitchen? Take advantage of the natural light and fill the space with gentle linens, natural wood textures, and plenty of plants. Sleek black accents lend an elegantly modern touch to this style-filled breakfast nook. Outfit the tiny, whitewashed nook with pops of primary shades and plenty of fresh greens. Consider this an extension of the kitchen counter. Top a low-set cabinet with an appropriately sized cushion for an additional source of seating when needed. A classic color block creates a defining layer to an otherwise minimally furnished area. Corner-curved shelves make great use as an additional source of storage. A fully-stocked bookshelf couldn’t be located at a better spot, especially for long mornings reserved for coffee and a good book. This charming eating spot may be compact but there’s no denying its stylish functionality. Steel-paned windows set a dreamy backdrop complemented by the glossy black floors of this elegant kitchen. Adorn the breakfast nook with a massive gallery wall in lieu of wall paint! Note how it manages to distract the eye from the break in corner of the two walls. A kitchen nook within a built-in bookshelf (we can hardly keep up, ourselves) truly redefines the double-duty space. This whitewashed nook challenges the ordinary with an intricately patterned floor tile. With stainless steel cabinet fronts, a subway tiled accent wall, and a thematic and over-sized wall print, the bright yellow seating hardly even seems that noticeable. A simple bench paired with a small round table makes for an impromptu breakfast nook that’s chic and functional. A window-length bench provides a convenient spot for the kitchen and dining room mashup. A plain wooden table coupled with a set of whitewashed kitchen chairs transform a plain corner into a pin-perfect spot. Drawers positioned within the benched seating in this modern breakfast nook use up every available square inch of possible storage space. A free-standing cupboard coupled with a cozy sheepskin makes for a very convenient spot to sit in! Take advantage of the empty wall space in the kitchen corner by turning it into a breakfast nook that is as chic as this! This tiny Parisian breakfast nook proves that less is always more. Transform the teeny sliver of empty space between the fridge and the windows into an intimate spot for your morning coffee. Pair the whitewashed space with natural wood furnishings and charcoal-shaded pillows for a more reserved aesthetic.